I am no longer a complete refugee crafter! For months all of my current projects have been cluttering my kitchen floor. I finally decided that enough was enough and I needed to find a better place to put them other than their previous home in my son's closet where they were unreachable during that glorious time of day when I get everything done called "naptime." 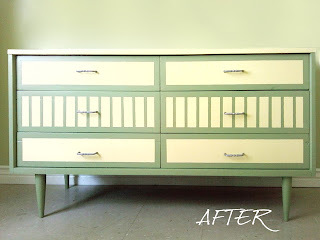 I found this $30 dresser at a thrift store in poor but sturdy condition and made it over by first painting it with a high adhesion primer and then with latex paint. Some of my supplies were left over from previous projects. I used painters tape to help in creating the stripes. 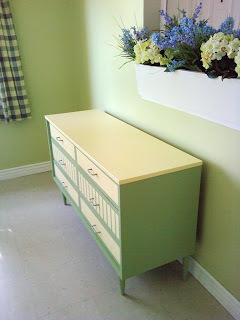 HANDY TIP: I highly recommend using a small cabinet roller for a project like this. I got one from Lowes. I think the brand was "Whizz." I loved it because it was a sponge with rounded edges so I didn't have to worry about corners or streaks. 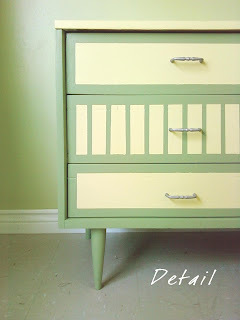 I wish I'd had it for previous projects, particularly the one where I decided to paint all the kitchen cabinets. That is WAY, WAY cute!! Good job for seeing past the "not so cute" in the beginning and making something beautiful. That is a talent I wish I had!! Oh and thanks SOOOOO much for the wonderful surprised in the mail. I was so happy to open that today! You are so nice to have done that. Thank you!! This turned out SOOO cute, oh my goodness, I loved the colors!! I need to go dumpster digging!! Tabi, so I have a question about the flowers you have in the last picture. How did you make that whole arrangement? It looks so beautiful!